Objectives: (i) To develop a national strategy for pharmacy preceptor education and support, with special consideration for rural and remote practitioners. (ii) To deliver an innovative national core pharmacist preceptor education and support model that could be customised for specific undergraduate programs. Design: A steering committee, with representatives from four Pharmacy Schools in three Australian states, was established to develop an educational curriculum and implementation strategy. Setting: The project was designed to provide an online educational program for preceptors of Australian pharmacy students, particularly those in rural areas. Subjects: The recipients of this program will primarily be rural pharmacy preceptors but could also be urban practitioners. Interventions: After consultation with an advisory group, the steering committee considered the educational content, delivery strategy and adaptability of the package to maintain its currency and links to universities, pharmacy boards and professional organisations: an extensive literature search was conducted; writers and an educational designer were employed. The steering committee reviewed and modified the content before transfer of the program to the worldwide web. 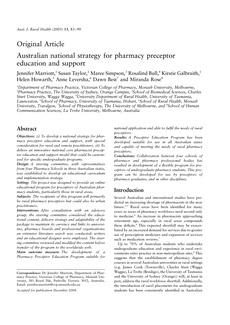 Main outcome measure: The development of a Pharmacy Preceptor Education Program suitable for national application and able to fulfil the needs of rural preceptors. Results: A Preceptor Education Program has been developed suitable for use in all Australian states and capable of meeting the needs of rural pharmacy preceptors. Conclusions: Collaboration between four schools of pharmacy and pharmacy professional bodies has resulted in development of a flexible program for preceptors of undergraduate pharmacy students. This program can be developed for use by preceptors of pharmacy graduates, and in other disciplines.